Capture the follies of training Fido with this Bad Dog? Tumbler set. 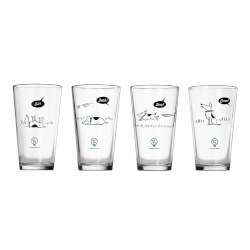 Four pint glasses depict a lovable pooch doing the exact opposite of the commands being barked. Glassware made in the USA. Decorated in Edina, Minnesota. Sold as a set of four. ? 2007 UncommonGoods, LLC Complete your litter of Bad Dog ? with mugs and coasters! Also, check out the Bad Dog ? Wisdom glasses and mugs! Click here to download our free Printable Bad Dog Birthday Cards.